Cup cakes or muffins or whatever you call, they are one of my favorite snacks when I have baking sessions. There is still so much of learning process going on with my baking and using oven. I tried different muffin-recipes but always ended up with very dry and hard ones. Finally I got hold of a very good one which leaves the muffins moist from inside and fluffy and soft all over even after 2-3 days kept at room temperature stored in not so air-tight container. The search for a perfect blueberry muffin recipe is over, for me ;) after I tried and tested this recipe from Recipezaar.com. soft after 2-3 days, huh? This recipe is a keeper for sure then... Have a great weekend Padma! 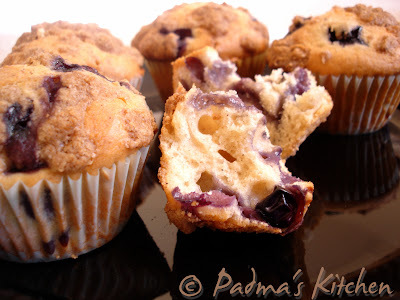 Hi Padma: I have been a silent spectator of your blog till now but couldn't resist the urge to leave comment after seeing the delicious blueberry muffins. Blueberries are our favorite at home and I know I will be trying your recipe soon. YUM! I like the idea of adding orange juice. I bet you could add the egg and the orange juice with minor adjustments. This is another recipe I would like to try. Thanks Padma! Also loved the fact that this can be made eggless way ( not that I am allergic, but cannot stand the egg-yolks). fresh even after a couple of days..wow...and these look delectable!!! I AM SO SORRY!!!! I thought this was a blog about the host of Top Chef. I clicked on the link and was saying to myself "Oh boy here we go again with another celebrity" BUT OH MY WHAT A GREAT BLOG!!! I love it! Your recipes are delicious looking. 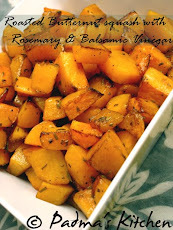 I am subscribing to your feed and adding you to my blogroll :) Delicious! Wow! This is a wonderful coincedance or what! Two of them to be more precise! 2) I sat down to chk out blogs jus after finishing blueberry and cinnamon muffins! I will post that in a couple of days! Wow, these look amazing. My grandma loves making things with buttermilk living on a dairy farm, so I must tell her about these. the muffins look perfect padma! I use sour cream too, so I guess these should be soft too:) bookmarked to give it a try! 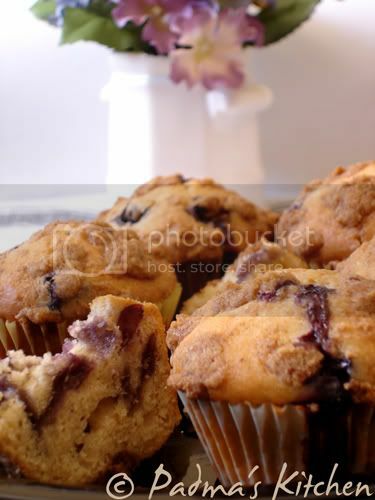 I love the swirls that the blueberry lends to the muffin and they look so soft and moist. Thanks for a great recipe. Hey padma, those muffins are looking great. I will have to resist myself though cannot have too many sweets as I will have to stay away from them for atleast 7 more months. It hasn't snowed here on the plains, or at least the snow melted away quickly. You say it's perfect, I trust you. Moreover your picture is an added proof. Will surely try this. Thanks for sharing. Oooh these look great, and it looks like they keep pretty well too! very inviting with a cuppa coffee. Waiting to see blueberries in the bangalore market. Great minds think alike!! I'll have to try your recipe - the crumble topping sounds great! These muffins sound oh so good! I doubt they last 2-3 days in my house to test your softness time. Any baked good does not make it more than 1 day around here, but I like watching my family enjoy them. have been looking for a good recipe for muffins since ages,thx Padma. I love blueberry muffins, and your buttermilk blueberry ones are very tempting! lovely looking muffins padma.I like many recipes from your blog.my all time fav one is udidpi sambar. yummy muffins.....seem to be very delicious! !hey do check out my blog,recently started. Can anyone please tell me if and where blueberries are available in Bangalore? Lets straight aways go the the recipe without wasting much time and ofcourse, I know you gals have to do bloghopping too! So keeping this short amd simple. You should probably copyedit and remove sexist comments before posting your recipes — which are delicious. I gather you are not a native english speaker, but you should at least read over your writing before publishing, to make sure you didn't make any mistakes that you can catch. Lets straight away go to the recipe without wasting much time and of course, I know you gals have to do bloghopping too! So I'm keeping this short and simple. Simply reading over your post would have caught these mistakes. That said, I was more offended by the suggestion that your readers are exclusively female. I know as many men that enjoy baking as women. Although this stereotype may be largely true in your culture, in writing for a larger audience you should avoid bias and bigotry, especially if it may be interpreted offensively in other cultures. Thank you John for bringing this to my notice. 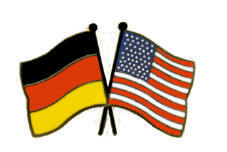 No, I am not a native english speaker. I am not that good at writing, but I am positively improving my writing skills. I admit that I should not have made such gender bias statement. Will definitely edit my post. well john the majority of people who bake at home are female so it wasnt really gender biast, get a grip man and stop trying to be so politically correct. she hit the nail on the head her target audience are women thats the simple truth and who do you think you are correcting her grammar ! 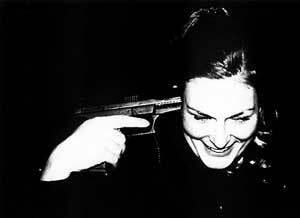 the utter nerve of you makes me so mad. This recipe worked perfectly! It's pretty rare to find a recipe on a blog that works so well... especially when it comes to baking. Thanks so much!!! I found your blog by searching for a buttermilk blueberry muffin recipe. I tried these on Saturday, and they were awesome! My whole family gobbled them up! Thanks for sharing! Wow...just made these and they are delicious! You're amazing!! Thanks so much for sharing. I have been making different versions of blueberry muffins for a couple of years now. This is hands down the best blueberry muffing recipe to date. My husband said they were "impressive"! I folled recipe exactly, but I added some chopped walnuts to the topping part of it. These were delicious! I used veg oil instead of butter, they are so fluffy and light.